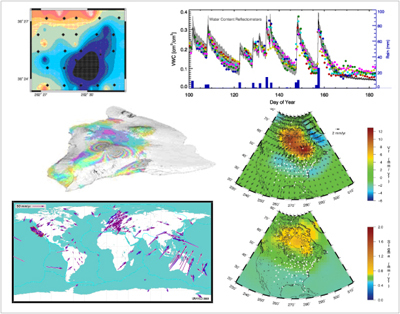 In response to new and emerging research opportunities in geodesy and its interdisciplinary applications, the geodesy community is preparing a written plan in a Grand Challenges format, identifying emerging science questions, required workforce development and diversity, and needed instrumentation and facilities. The intention is to have a draft by AGU and final plan by January 2010. This plan will inform a number of other national science planning initiatives anticipated in 2010. UNAVCO community members and workshop participants at the October, 2009 Long-Range Science Goals for Geodesy Community Workshop will produce a written draft that will open for community input in November. Over two decades, rapid advances in geodesy have opened new fields and enabled the interrogation of the kinematics, structure, and dynamics of the solid Earth and its fluid envelopes. With the continued development of advanced terrestrial and space geodetic methods, geodesy has grown rapidly and there are now crucial geodetic applications in a wide range of scientific fields, from ground water systems and fault dynamics to mapping the speed of ice flows and the amount of water vapor in the atmosphere. The pace of this change is quickening, and is coupled with the recognition of this technology-driven science as a national asset in a global economy. (12) community commitment to integrative scientific studies that link massive data sets to physically-based models, with direct relevance to mitigation of natural hazards, through the collection and stewardship of long-term geodetic observations. Reflected GPS signals (colored dots in figure) at a station in Marshall, Colorado, show a strong correlation with in situ soil moisture measurements (gray band), both display soil drying after descrete rain-fall events, Larsen et al, 2008. More information is available here. Stable North American Reference Frame 1.0 velocity field adjusted for glacial rebound, Blewitt et al, 2005. Composite GPS Velocity Map from sources in table below, showing solutions from GPSVEL 0.2, IGS ITRF96, and SCEC 2.0 in NNR (No Net Rotation frame). More information is available here. Unpublished image, see similar images in: Amelung, F.,S-H. Yun, T.R. Walter, P. Segall and S.W. Kim, Stress control of deep rift intrusion at Mauna Loa volcano, Hawaii. Science 316: 1026-1030 [DOI: 10.1126/science.1140035], 2007. More information is available here. Tomography Solutions During the Water Vapor IOP. The panel shows a moist pocket of air that runs through the boundary layer. These fields describe how the water vapor is varying within the volume with respect to the mean water vapor profile. Braun, J. and C. Rocken, GPS Measured Water Vapor Variability at the ARM SGP CF, Proceedings of the Eleventh Annual Atmospheric Radiation Measurements(ARM) Science Team Meeting, Atlanta, Georgia, March 2001. More information is available here and in this PDF.